Commuters at Connolly station were left tapping their toes as they waited today, as a woman played a touching piano ensemble before her train arrived. Train stations can often feel like dull experiences but these lucky passengers certainly had their day brightened up an impromptu performance by this talented pianist. 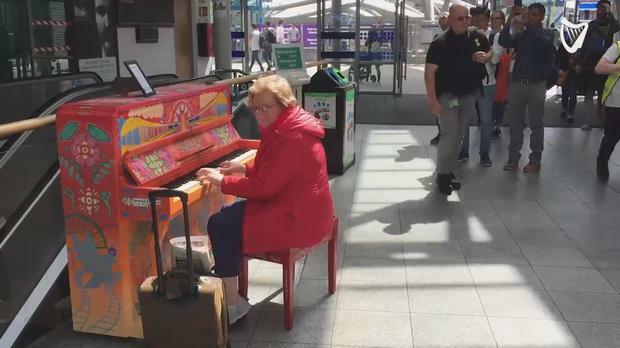 Mary Deignan, from Carrick-on-Shannon in Co Leitrim, was waiting for her own train when she decided to "have a go" at playing the new piano in the Dublin station. The station performance was said to be "a warm up" ahead of a wedding that she is playing at in Sligo tomorrow. Last month, Irish Rail unveiled the new instrument, which was beautifully illustrated decorated by artist Holly Pereira. It is the third piano to be publicly installed by Iarnrod Eireann, with others located in Pearse Station and Heuston Station. Rachel Farrell It was an emotional morning for families at Dublin Airport today as thousands arrived home to Ireland for Christmas. Rachel Farrell A renowned tree sculptor has transformed a tree outside a Dublin dentistry into a giant tooth- and it has to be seen to be believed. Rachel Farrell Thousands of homeowners and businesses in Killarney, Co Kerry were left without water after a burst water mains caused major flooding in the town.